This was one of seven works commissioned by publisher George Barrie as illustrations for his monumental work The Army and Navy of the United States, published in Philadelphia, 1889–95. It was reproduced in section 6 as a 5-by-6-inch black-and-white photogravure. Trego shows each of the four mortars at a different step in the routine of firing. The men in the foreground are positioning a nine-inch mortar, while those behind them are loading a much larger thirteen-inch gun. The third crew farther back is apparently getting ready to fire, and in the far background, the last mortar is actually being fired, the trajectory of the shell traceable by a trail of smoke. The early provenance after its original owner, George Barrie, is unknown. By 1959 the painting was part of the celebrated collection of military paintings assembled by Alexander McCook Craighead. Craighead bequeathed the painting to West Point Museum in 1968. As “A Mortar Battery Firing,” it appeared on the cover of Civil War Times Illustrated 14, no. 3 (June 1975). 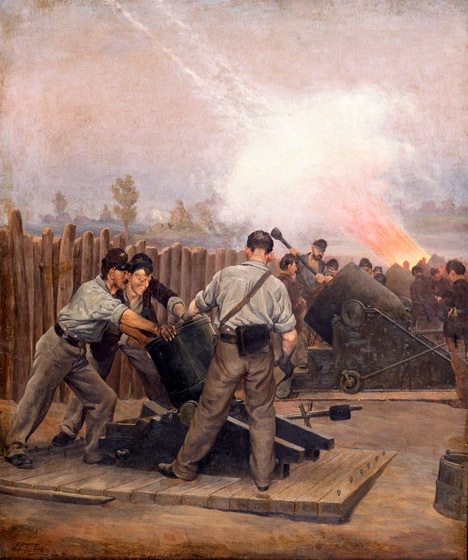 As “Mortar Battery,” it was used to illustrate an article by Pierce Rice, “The Painters of the Civil War,” Art and Antiques (January–February 1980), p. 112. As “Mortar Battery Firing,” in Helen Hartman Gemmill, “William B. T. Trego, the Artist with the Paralyzed Hands,” Antiques (November1983), p. 9.